Tag Archive | "Windows 8"
At Christmas this year, my children and grandchildren surprised me with a shiny new laptop. What happened to my old laptop, a startling and embarrassing tale, is a story for another day. Upon powering up my new chariot into cyberspace, I found myself thrust into unfamiliar and very uncomfortable territory, Windows 8. Where was my start button? What happened to my desktop? These were just two questions that popped into my head as I was greeted by what I later learned was the Windows 8 start menu. Fortunately for me, my oldest son was there to help. He had had about ten minutes experience with the new operating system and provided me with some of the basics. Otherwise, I wouldn’t have known how to turn the damn thing off! It is said that an expert is simply someone who knows a little more about a subject than you do. And, in that sense, my son is an expert, although I must admit, after a number of days of wrangling with connectivity and compatibility issues, I realize that his knowledge of the system could fill a thimble. To the experienced user of an older version of Windows, Windows 8 is baffling. Designed in my estimation for idiots, the new Start menu is a screen chock full of square and rectangular blocks of various sizes that extend beyond the righthand side of the screen. To see the blocks that are not on your initial screen, you must use a slider bar or, if you have a touch screen enabled model, your finger to slide the contents from right to left. Most of the blocks relate to programs or services for which you can receive a “free trial,” but ultimately must purchase – making Windows 8 the most commercial version of Windows ever. The blocks when touched or clicked transport you to various programs, websites, online services, and even, as was demonstrated to me, your desktop. Outlook has been replaced by Windows Mail. And oddly, when surfing the Internet, you will notice that Internet Explorer looks different when launched from the Start menu or from your desktop. When accessing the Internet from Internet Explorer on your Start menu, you lose all the familiar navigation tools upon which you have come to rely. Under these circumstances, simply closing a window becomes a chore! At age 87 with diminished vision and hearing, I am attempting to open the door of knowledge that will lead to Windows 8 nirvana. I pray that I have the patience, mental capacity, and time to reach that exalted state. Yet, I must comment on the fact that Microsoft Corporation, like virtually every other business entity today, has redesigned its signature product as a marketing tool to promote other of its own as well as third-party products. Eschewing items that once were incorporated into the operating system for free, Microsoft now compels users to purchase these add-ons or live without them. As I journey through life, I have come to realize the validity of the old adage “if it ain’t broke, don’t fix it.” And, I believe that this is just what Microsoft has done in introducing the Windows 8 operating system. In a world driven by commercialism and devoid of “free lunches,” consumers can vote with their pocketbooks – tried-and-true or new-and-baffling? Which way will you vote? 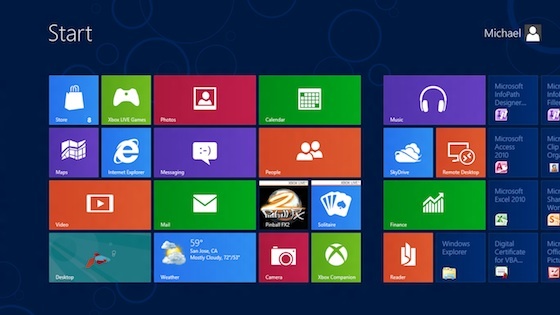 Will you shun Windows 8 or embrace it? As for me, my Christmas joy has waned. Instead of a Happy New Year, I find myself in the throes of the Windows 8 blues.